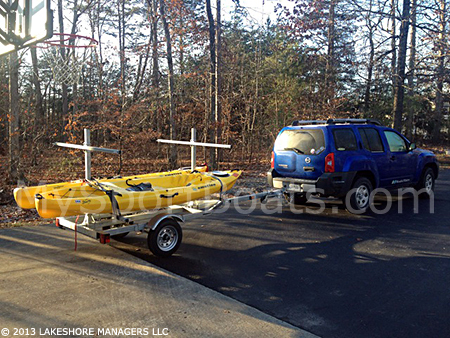 The Genesis 8 Kayak Trailer / 4 Canoe Trailer can carry up to four canoes or eight kayaks (carried on their sides at 2 per carry arm). 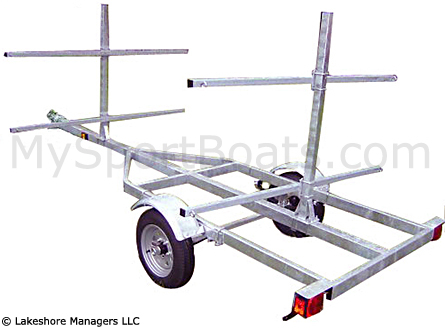 Trailer features an all welded hot dipped galvanized frame, 12" wheels, adjustable uprights, and adjustable carry arms. Designed for years of reliable service. 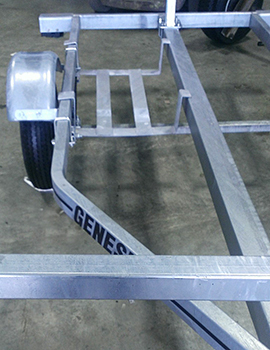 The Genesis 8 Kayak Trailer / 4 Canoe Trailer ships unassembled on a pallet by truck freight (semi). 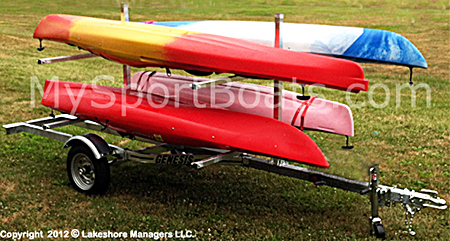 For this trailer to carry 8 kayaks, they must be carried on their sides 2 per carry arm. The maximum width of kayaks if carried on their sides 2 per carry arm is 30" (can be increased to 36" with G-6UP upgrade - see options below). Easy to put together, good quality, tows well at highwy speed. Very happy with it.